The Importance of Topsoil - How Important is Topsoil? So How Important is Topsoil ? Have you ever stopped to think about the importance of topsoil? Maybe it’s because it’s often impossible to get out into the garden or allotment at this time of year, but somehow, it seems the appropriate time to reflect on issues like this. At its most basic, top soil is the top layer of soil, in which all plants grow. It usually covers a layer of subsoil, which in turn covers the rock underneath, although when the soil is very thin, topsoil and subsoil may be indistinguishable. 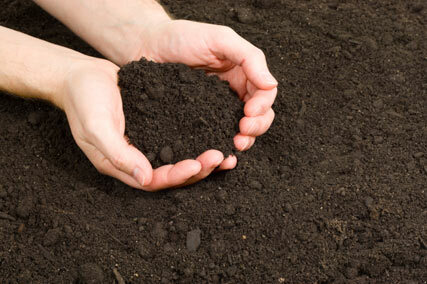 Topsoil is so important because it contains all the nutrients that plants need to survive. If you want to grow plants, good topsoil is absolutely essential! So what sort of topsoil do you have? Topsoil is defined by the size of particles. A soil with very small particles, that stick together when you roll a little ball of it around on your hand, is clay. It will feel sticky in your hands, and has very good water retention. This means that it gets very muddy in the winter. Very large particles are called sand. As you would expect, sandy soils drain quickly, which means that you need to water regularly in the summer. Soils that contain a mixture of sand and clay are called loam, which is the ideal soil, and the one that all gardeners crave. You can improve both sand and clay, and make them more like loam, by adding plenty of organic matter in spring and autumn. Check out our guide to improving your topsoil for more information. In certain parts of the UK, you may also find that your soil contains chalk. This will often be obvious from the chalky white particles that may be visible in the soil. However, you may still have alkaline soil, even without visible chalk. To check, drop a small piece of soil into a jar of vinegar. If it froths up, the soil is alkaline. These soils are very free-draining, and organic matter decomposes fast, which makes them a challenge for gardeners. On the plus side, some of the most fertile farmland in the country is on chalk soils, so it’s quite possible to get plenty to grow. It is, however, very difficult to reduce the pH significantly for a long period, and make them less alkaline, so you will need to choose your plants with care, and avoid lime-hating species such as rhododendrons, azaleas and camellias. If your garden soil is poor quality or very thin, which can happen especially in new houses, you can buy topsoil to supplement it from topsoil suppliers. It comes in several different grades and qualities, so pick the right one for your needs, using our helpful guide to buying topsoil .